The Aged P threw a National Day party for our relatives yesterday, and she served up this delicious cake with a Singapore twist – so I asked her if she would share her recipe right here on Owls Well! If you’re still looking for an Impressive Dessert for your National Day Party, here’s the Aged P’s special National Day Red-and-white Velvet Cake recipe. Aged P’s Tip: This kid-friendly recipe uses natural food colouring as well as a reduced sugar frosting that holds up well in Singapore’s warm summery climate. 2. Cook in a pot with enough water to cover the cubes, over low flame, for 1 hour. 1. Heat oven to 170C. 3. In a small bowl mix Milo with natural beetroot cup red food colouring. Set aside to cool. 5. Cream butter and 1-3/4C sugar until light and fluffy. 10. Mix bicarbonate of soda and vinegar in a small bowl then immediately add the mixture to the batter, folding in gently. 11. Pour batter into prepared loaf tins and bake in oven for 35 minutes or until the cake tester comes out clean. 12. Remove from oven and cool completely before frosting. Aged P’s Tip: If you’re using regular commercial food colouring instead of the natural food colouring, use 2 tsp of food colouring and increase the milk by 1/4cup. 1. Whisk plain flour into the milk. 2. Cook over low flame, stirring constantly until the mixture is thickened. Set aside to cool. 3. Cream butter. sugar and vanilla until fluffy then add the cooled thickened flour mixture. 4. Beat the mixture until fluffy. Well well well, I have now completed TWO of the baking challenges that ABC (A Becky C) has set for me this year! This one satisfies the criteria ‘something savoury that isn’t a pie’, and it is a mix of two recipes introduced to me during my student days by two different women. One of these women is a fine lady that I met as a student in London, who basically adopted every single person who didn’t have a home and family to escape to every weekend. Every Sunday afternoon, she would invite starving stragglers like myself to her home for lunch where she would serve us all a delicious meal of baked chicken parcels, piping hot from the oven, whilst her husband entertained us with snippets of The Goon Show. She never knew how many people would be gracing her home during Sunday afternoons, but somehow there was always more than enough to go round. The other woman is a girl that I knew from school who was studying in Germany and also met a fine lady over there who also adopted all poor and starving International students and served them baked stuffed chicken for Sunday Lunch. My friend visited me in London one time and made the dish for me. I’ve now come to associate baked chicken with hospitality and kindness, and I’ve taken the liberty of combining the two recipes together, which I think works pretty well! I have also included additional Thermomix instructions at the end of the recipe for those of you who own magic stirring pots. In honour of the two women who opened their homes and hearts to strangers on Sunday afternoons, I am calling this dish, “Mary-Full-Of-Grace Chicken”. Using a sharp knife, butterfly each chicken breast by slicing it carefully down the centre but not all the way through. Alternatively, you can use a rolling pin to flatten each chicken breast to a 1/2 inch thickness. Spread 2-3 tablespoons of cream cheese in the centre of the chicken breast. Recently, supermarkets in Sydney have stopped stocking fruit-flavoured extracts and essences because teenagers have been buying them in bulk and scoffing them to get drunk. Since I love baking cakes, this has posed a problem for me, since I can’t even get vanilla essence anymore for baking! The solution? Make my own flavoured essence, of course! After consulting with a few friends, and looking up a few references, I was ready to embark on my essence making journey. Becky’s Note: In order to get the best results, I highly recommend using a vodka that’s as close to flavourless as possible. The more distillation and filtration, the better! Absolut Vodka is pretty good for this, though I’ve heard that pricier alcohols like Grey Goose and Belvedere are good as well. Open the jars, fill them with boiling water, then immerse them and the jar lids in a pot of boiling water and boil for about 15 minutes. This will get rid of any nasty bacteria that may be hanging around. The alcohol will take care of the rest. Make sure that you use tongs when removing the jars from the hot water. 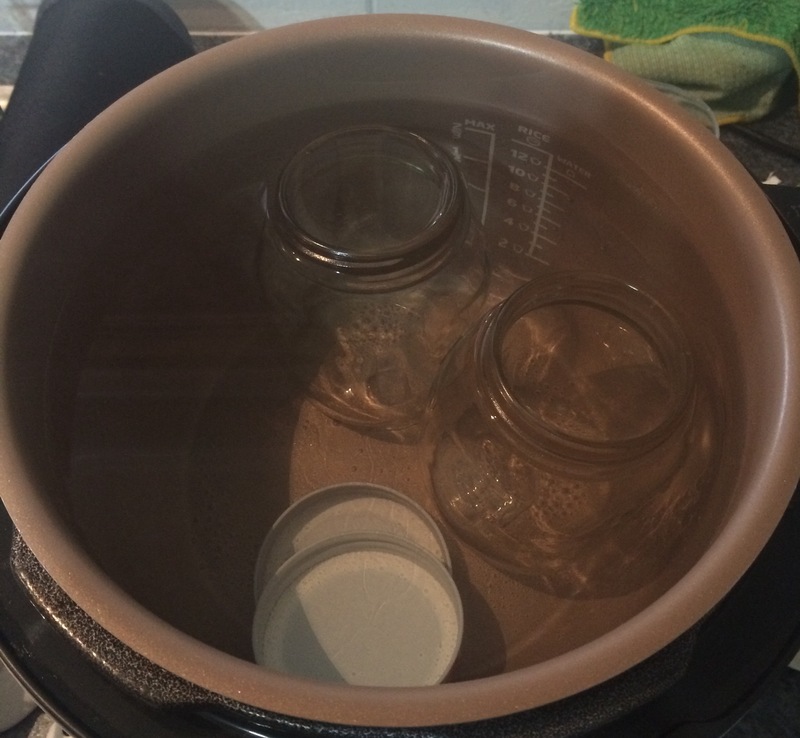 Dump out the water, then use a clean towel to dry the jars and lids up. Make sure that the jars are completely dry before use. 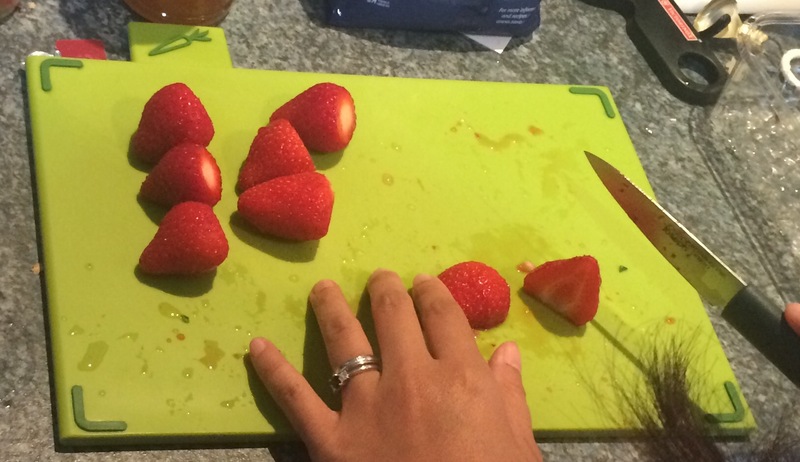 For most berries, I recommend dicing up the fruit so that each piece is roughly 1 cm big. This will increase the surface area for the alcohol to leech out the berry flavour and juices. For blueberries, however, don’t bother cutting them up, simply use the tip of your knife to poke a small hole in the skin of each blueberry. 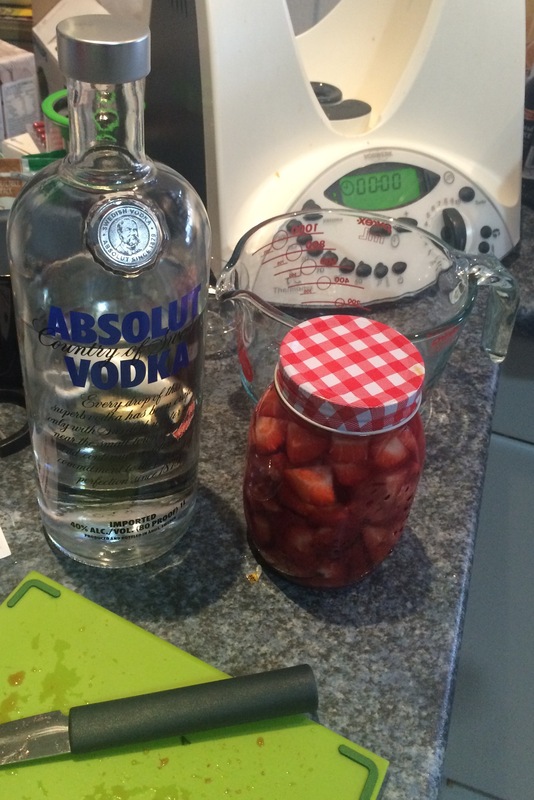 If you’ve got a 500 ml jar, you can just put the berry pieces into the jar and top the jar up with vodka. However, if you don’t have such a small jar, then make sure to measure the vodka out carefully, as the 1:1 ratio of vodka to fruit is very important. Becky’s Note: Should you decide to drink some of the vodka at this stage, please be warned that vodka is 40% alcohol by volume. Make sure to eat something and drink lots of water as well! Screw the lids of the bottles on tightly and put the essence bottles away in a cool, dark place for 6 weeks. Do NOT expose the essence bottles to light if you can help it! This can really ruin the flavour! Becky’s Note: As you can see in this picture, I’ve made lemon essence as well! Making essence out of citrus fruit entails a whole different process – instead of 250g of fruit, you’ll need the zest of about 1 kg of lemons for every 250 ml of vodka you use. The resulting jar is therefore less full of liquid, as lemon zest takes up a lot less space and is more potent than the berries. 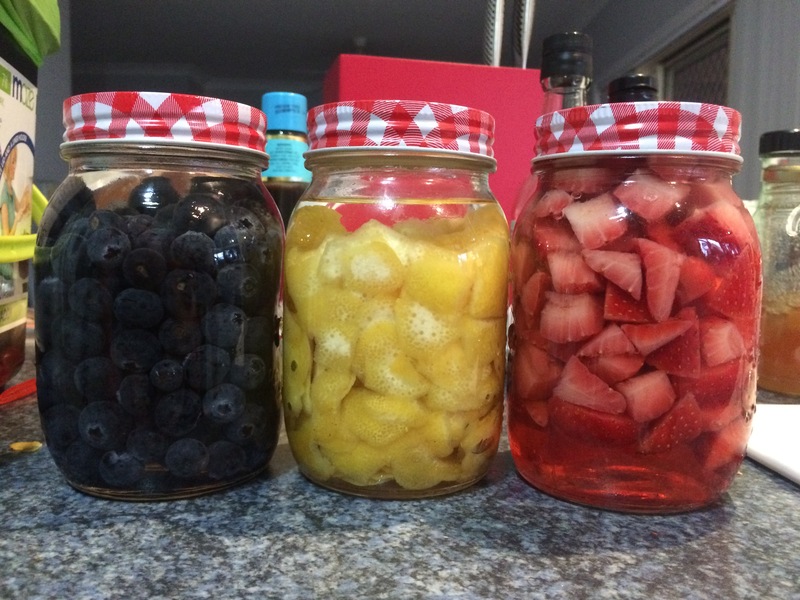 Over time, the liquor should gain more of the colour of the fruit, while the fruit loses its colour as the flavour is leeched out by the vodka. Step 4: Filter out the fruit and bottle the essence in smaller jars! After 8 weeks, take the bottles out and filter the fruit out! You can now bottle the results up for baking and cooking! Recently, I convinced the Aged Ps to take the kids for a Peranakan Day Out, so that they can learn more about Peranakan culture and what it means to be a Baba or a Nyonya. Here’s how you can enjoy your own Peranakan Day Out in 10 easy steps! This is a really great book that not only introduces the Peranakan Museum and it’s highlights, but gives some easy to read information about Peranakan culture. In the book, Stacey visits the museum and has an adventure with a mysterious girl who takes her on a personal tour! I really love the detailed illustrations by James Tan, and it really is such a treat to be able to read the book to the kids, and then see their reaction once they reach the museum and recognise the things that they see in the pictures. I was very fortunate to have received a copy of this book from Armour Publishing for review, but you can get your own copy from the Peranakan Museum shop or direct from the Armour Publishing website. The book is part of the Stacey & the Museum series by Lianne Ong – here’s a review and book trailer that I made for the first book in the series, Stacey Goes to the National Museum. The Peranakan Museum is a wonderful little museum installed in the former Tao Nan Chinese School, and has a beautiful and extensive collection of Peranakan objects, wonderfully curated in a manner that illustrates the tradition and distinctive artistic style of the Peranakan community. There are many interactive components for children within the museum, some on large computer touch screens, and others requiring and encouraging children to touch and handle vintage objects. J and Little E enjoyed running around the museum completing a little treasure hunt – the activity sheet can be collected at the information counter. We visited the museum with the Aged P, who is of course a true Peranakan but there are guided tours conducted daily by volunteers (most of whom are also Peranakan or are scholars of Southeast Asian culture) are more than happy to regale you with personal stories about Peranakan traditions! The Peranakan Museum is open daily from 10am – 7pm (extended hours to 9pm on Fridays) and is located on 39 Armenian Street, Singapore 179941. Admission is free for Singaporean Citizens and PRs, as well as for children under 6 years old. 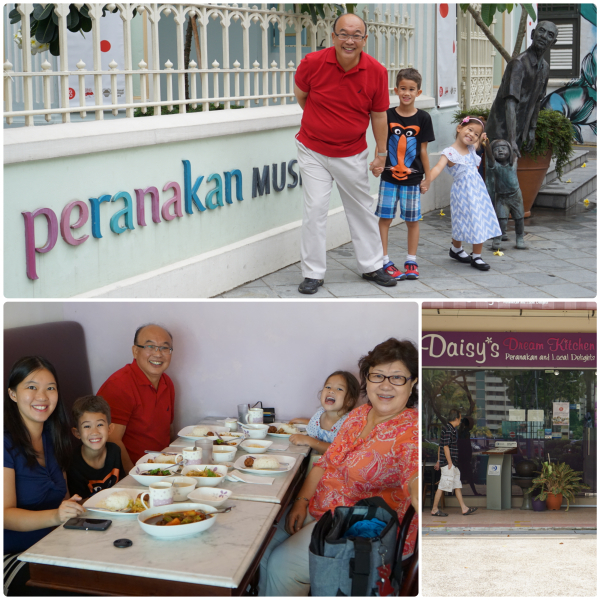 We ate at Daisy’s Dream Kitchen, which is a small little family-run eatery over in the West Coast serving Peranakan food as well as a selection of other local dishes. The food is delicious and reasonably priced, with a lovely home cooked flavour and the Aged Ps deem it ‘Cheap and Good’ (which by their standards, is very good indeed). Peranakan food tends to be very rich, so I was surprised and glad to see that the dishes served were not swimming in grease, but were low in salt and oil with no loss to the fullness of flavour. We even met Daisy’s kids and grandkids, who had dropped in for lunch, the little 5 year old grandson even coming to our table to thank us for visiting! What a little charmer. If you are looking for a fancier Peranakan restaurant with a larger range of traditional dishes, prepared and displayed in a traditional manner, the Aged Ps recommend The Blue Ginger Restaurant, which is where they like to bring out-of-towners when they want to truly impress. To get a true taste of Peranakan culture, the Aged Ps recommend that you try the Nyonya-style Ngoh Hiang, the Bakwan Kepiting soup, the Babi Ponteh stewed pork and the Ayam Buah Keluak stuffed blacknut when you are visiting a Peranakan Restaurant. Peranakans are known for their involvement in Dondang Sayang (Love ballad) and Keroncong (Malay-style ukelele band) forms of music. The Aged Ps were very insistent that I chose the correct kind of music to accompany this video, and so I have gone for the Dondang Sayang style of Peranakan music. The Dondang Sayang style is exemplified by the exchange of lighthearted and cheeky malay poetry (or ‘pantun‘) between two singers. We didn’t include a visit to a dressmaker to try out fancy Peranakan fashions and learn how to tie a sarong in the traditional way, but that would be a fun way to round off the day with an impromptu fashion show, especially if you have kids who love dressing up. 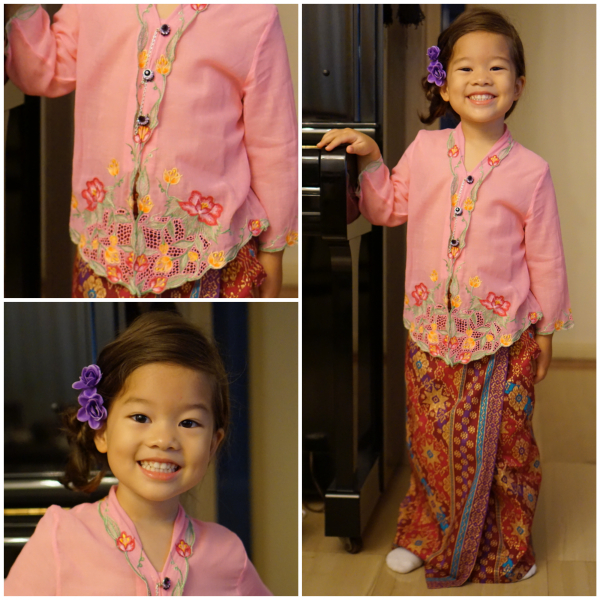 We love Toko Aljunied for their beautiful kebayas and batik shirts – you can find out more about this wonderful purveyor of fine Peranakan fashions for kids and adults here.